Each year I love sharing some of the products that I am loving in my own life and I believe in supporting other small business owners and giving these products as gifts too! This is why it is so important to small business owners like me that when you love our products you share with your friends and family. You sharing is the best thing you can do to bless us. Here are some of the products and small business owners that we are LOVING in our home and life. Teapressa is not only amazing tasting but beautifully packaged. If you get their tea please try the elixir too (Rose or London Fog is my favorite). Elsie Green is my go to when I wish I could hop on a plane to France and visit the Paris flea market. When a plane ticket is not possible I promise you that Elsie Green may just be the next best thing. Go to your local bookstore and find this incredible book filled with sketches, paintings and studies of Helga by Andrew Wyeth. I don’t remember the last time I was so inspired. If you have an artist in your life I think they will treasure this book and the story behind it. Else Green again and this time with one of my favorite things to collect…vintage cocktail glasses. I often find my vintage cocktail glasses from our local antique shop, Dwell Antiques. Young Living isn’t a small company but the men and women that sell their amazing product sure are. I adore their oils and this diffuser in particular is crazy amazing and beautiful. If you need help finding a source to purchase from please ask. I know so many amazing and hard working women I can refer you to. You can always start with Jana Roach, Kara Rosenberry, and Danielle Burkleo. One of my very favorite local small businesses is Hygge Life in Vail, CO. You can often find Alexandra selling closer to us in the best markets and I ALWAYS find something too good to pass up. These mugs are one of my favorites and the perfect pairing with the beautiful tea above. While we were in Round Top this fall I discovered the shop Stash. I truly wanted everything in the shop. 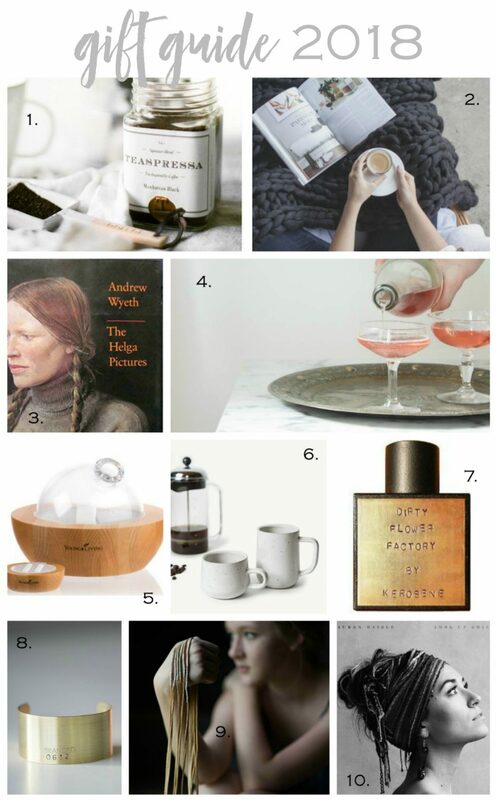 It was incredibly curated with vintage, home, jewelry and speciality gifts. I picked up this perfume there and I love not only the scent but the packaging too. If you have taken a live art workshop, business workshop or an online course with me…most likely I have talked about the company Branded, their products and their STORY. Come and read all about it and gift the most incredible gift this year. Here is another artisan piece I pieced up at Stash this fall. Buy several and wrap your wrists with them. I love mine so much and I have paint on them to prove it:-). I can’t have a gift giving list without music! The new album by Lauren Daigle is constantly playing over here. A fun alternative is to go to your local vinyl shop and special order the LP.